We send our congrats to small business entrepreneur Ilhem Memmedov (pictured on the left). Last year, we assisted with getting Ilhem a loan for his business through Kiva, which is dedicated to fighting global poverty by bringing microloans to the working poor in developing countries. 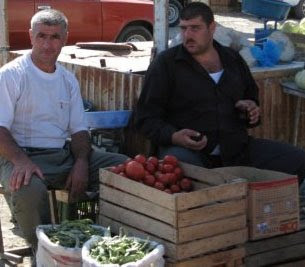 For 10 years, Ilhem has sold fruits and vegetables at the outdoor market in the northeastern town of Devechi in Azerbaijan. This loan, which he just paid off, will help him to build a store where he can continue to sell produce and be successful. We’re excited and humbled that we were able to be a small part of Ilhem making his dream a reality. As we mentioned last month, one of the ways we’re celebrating the Inn on Mill Creek’s 10th birthday this year is to assist with microloans to 10 entrepreneurs. Our first loan of 2009 went to Eusebia in Peru. 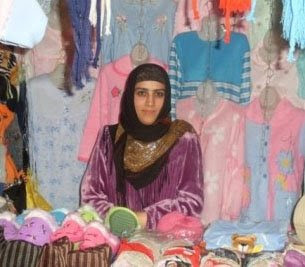 Now that Ilhem Memmedov has paid us back, we are using that money to lend to Mavjuda, a 31-year-old woman who started her own clothing shop in Tajikistan three years ago. This loan will help Mavjuda (pictured below) to grow her business. One thing we really like about Kiva is that they’ll send updates periodically with a few words from the small business owners themselves. We received an update recently from Rohullamen, a recipient of one of our microloans last November. Rohullamen owns a general store in Jalalabad, Afghanistan and he is the sole provider for his immediate family, which includes two brothers and a sister whom he would like to help obtain a higher education. Rohullamen wanted all of his lenders to know that he was able to use the loan to buy additional merchandise and expand his business, and that he hopes to open up a second store. His story is one reason why we participate with Kiva. The fact that Rohullamen is able to overcome the obvious obstacle of living in what is currently an extremely dangerous part of the world, and be able to build a better life for himself and his family is inspiring.